The Betway Group is a gaming company which is responsible for the Betway Casino site. This group is also in charge of the sportsbook & bingo site under the Betway label. The casino has taken a lead in rankings of online casino entertainment sites. Therefore, it is worthwhile to see whether it lives up to the high expectations that we've come to have of any potential ranking leaders. In terms of the design of the website, it is clear that nothing spectacular has been arranged. It is an extremely simple and markedly non-flashy site. In the case of the casino appearance, it would be safe to say that other casinos could easily win the battle in terms of aesthetic appeal. 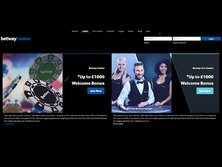 However, it's the content that truly matters when looking at a casino, although the background look is often an important consideration as well. The welcome bonus (Betway Casino Bonus) offer is divided into three separate deals. As a whole, the offer provides as much as £1000. The initial deposit results in a 100% match bonus up to £250. The second deposit makes it possible to get a 25% match bonus up to £250. Lastly, a third deposit enables the player to receive a 50% match bonus up to £500. It is necessary to go through the registration process in order to access the highlighted promotions. Other promotions have not been highlighted, which suggests that the casino has put all the emphasis on the welcome bonus offer. 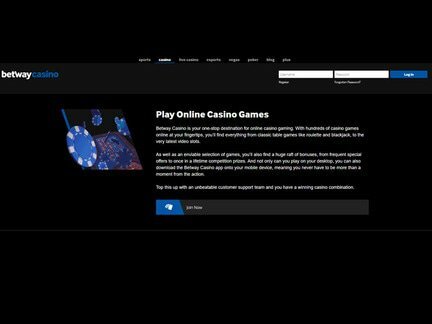 The casino showcases the payment methods at the bottom of the main page. Suffice to say, the users of traditional credit cards will not have any trouble with making payments here, as Visa and MasterCard have been approved for use. However, a few other services have been added to the mix in order to make the player's life easier. This would include; PayPal, Ukash, Skrill, Neteller & PaySafeCard. The players from UK are especially visible at Betway Casino. But the casino clearly has aspirations to become a global player and attract individuals from different locations. At the same time, it must be noted that there are some restrictions that have been mentioned by the casino. These access restrictions apply to players from several locations including; Australia, Belgium, Bulgaria, France, Denmark, Greece, Greenland, Hungary, Iran, Israel, Italy, Mexico, North Korea, Romania, Russia, Singapore, South Africa, Spain, Turkey & The United States of America. The classic casino games are making a comeback with the explosion of the web. The Bet Way Casino clearly attempts to appeal to the players with the timeless classics! The games would include; Blackjack, Roulette, Baccarat and Slots. The Blackjack is a superb game in which the player faces the dealer and attempts to beat him. It is a game that relies on strategy. The roulette is another classic game of chance that has captured the hearts of many of the players on the site. This game has great payouts, so it is important to play it on a regular basis. The casino has a good reputation. Some unresolved complaints remain. But the casino is still visited by countless players and major problems do not seem to emerge. One of the chief complaints has to do with withheld winnings. However, the individual cases are difficult to evaluate without full knowledge of the specific situation. It is best to leave this matter in the hands of the casino, but remain on alert when any new complaints emerge. The casino is licensed in the UK by the Gambling Commission. It is also licensed by the Malta Gaming Authority. I would not lose sleep over a fact there are a few unresolved complaints. The casino has had a fairly good reputation among online casino players. However, it is also the case that success can sometimes breed complacency. I feel that it would be best if the casino improved its promotional section, as one deal may not to satisfy an observing online casino audience, especially when there are so many options out there. I can say that the classic games on the site are worth exploring. I can definitely see myself endorsing this casino, especially after devoting the time to exploring its hidden treasures.